The Demag Cranes Group generated order intake of EUR 290.4 million in the first quarter of financial year 2011/2012 (first quarter of 2010/2011: EUR 284.0 million). This represents growth of 2.3%. Growth in order intake was contributed to by the Industrial Cranes and Services segments. The Group order book totalled EUR 390.0 million at 31 December 2011, up 6.6% on 31 December 2010 (EUR 366.0 million). In the Industrial Cranes segment, order intake increased by 4.2% from EUR 135.9 million in the previous year’s quarter to EUR 141.6 million in the first quarter of financial year 2011/2012. Almost all product lines contributed to this development. The order book in the Industrial Cranes segment stood at EUR 229.9 million at the 31 December 2011 balance sheet date, an increase of 5.5% compared with 31 December 2010 (EUR 217.9 million). Order intake in the Port Technology segment fell compared with the first quarter of financial year 2010/2011. Current uncertainty in connection with the debt crisis has slightly reduced the momentum in order intake over the past quarter. The products affected were Mobile Harbour Cranes. Segment order intake in the period under review was consequently EUR 59.4 million, down from EUR 63.7 million in the same quarter of the previous year. As at 31 December 2011, the Group order book for the Port Technology segment stood at EUR 99.1 million and was thus up 12% on the previous year. The order book as at 31 December 2010 came to EUR 88.5 million. In the Services segment, too, the orders situation improved compared with the previous year’s quarter. We recorded a 6.0% increase in order intake across all product lines in the segment. Order intake in the first quarter of financial year 2011/2012 came to EUR 89.4 million, compared with EUR 84.4 million in the same quarter of the previous year. The order book in the Services segment amounted to EUR 61.0 million at 31 December 2011, up from EUR 59.6 million at 31 December 2010. The first quarter of financial year 2011/2012 saw the Demag Cranes Group generate revenue of EUR 269.9 million – an increase of 16.7% (first quarter of 2010/2011: EUR 231.2 million). All segments contributed to the positive trend. The Industrial Cranes segment generated revenue of EUR 118.7 million in the first quarter of financial year 2011/2012, an increase of 15.5% on the previous year’s quarter (first quarter of 2010/2011: EUR 102.7 million). Products from both the cranes and the components business contributed to the increase. In the Port Technology segment, we attained a substantial 26.4% growth with revenue of EUR 66.5 million (compared with EUR 52.6 million in the first quarter of 2010/2011), which was attributable to increased revenue from Mobile Harbour Cranes and service business. The Services segment likewise recorded further revenue growth. We generated revenue of EUR 84.7 million in the first quarter of financial year 2011/2012, 11.7% more than the previous year’s quarter (first quarter of 2010/2011: EUR 75.8 million). All product lines contributed to this growth. At Group level, we generated operating EBIT of EUR 14.1 million in the first quarter of financial year 2011/2012. This represents an increase of 12.6% on the figure for the previous year’s quarter (EUR 12.5 million). In line with increased revenue compared with the same period a year earlier, we generated operating EBIT of EUR 0.2 million in the Industrial Cranes segment in the first quarter of financial year 2011/2012, up from minus EUR -0.5 million in the previous year’s quarter. Operating EBIT in the Port Technology segment came to EUR 2.1 million in the first quarter of financial year 2011/2012. This is roughly on a par with the previous year’s quarter (first quarter of 2010/2011: EUR 2.2 million). Operating EBIT in the Services segment increased slightly compared with the first quarter of financial year 2010/2011 from EUR 13.1 million to EUR 13.8 million. The improvement is mostly due to higher revenue compared with the previous year’s quarter. Uncertainties about how the economy will develop are making it increasingly difficult to give reliable long-term projections, also with regard to demand for the Demag Cranes Group’s products. It now seems possible that the implementation of strategic subprojects may be a challenge in the medium to long term, with corresponding implications for revenue and earnings performance. Despite the present uncertainties, the Management Board continues to anticipate further revenue growth for the current financial year. Demag Cranes plans to generate Group revenue of approximately EUR 1.1 billion in financial year 2011/2012. For financial year 2011/2012, the Management Board projects an operating EBIT margin of roughly 9.5% given attainment of the revenue targets, although this is ambitious against the background of the uncertain general conditions. The Demag Cranes Group is one of the world’s leading suppliers of industrial cranes and crane components, harbour cranes and terminal automation technology. Services, in particular maintenance and refurbishment, are another key element of the Group’s business activities. The Group is divided into the business segments Industrial Cranes, Port Technology and Services and has strong and well-established Demag and Gottwald brands. Demag Cranes sees its core competence in the development and construction of technically sophisticated cranes and hoists as well as automated transport and logistics systems in ports and terminals, the provision of services for these products and the manufacture of high-quality components. 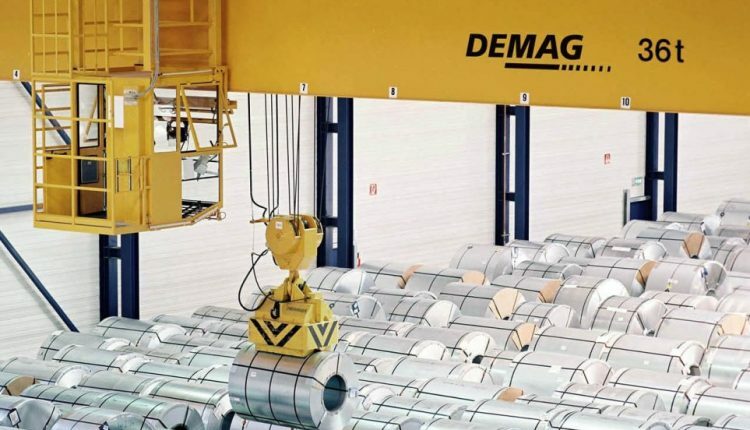 As a global supplier, Demag Cranes manufactures in 16 countries on five continents and operates a worldwide sales and service network that is present in over 60 countries through its subsidiaries such as Demag Cranes & Components GmbH and Gottwald Port Technology GmbH, agencies and a joint venture. In financial year 2010/2011, the Group, with its 6,115 employees, generated revenue of EUR 1,062.3 million. Since August 2011, the Terex Group in the United States (www.terex.com) has held a majority share in the company.